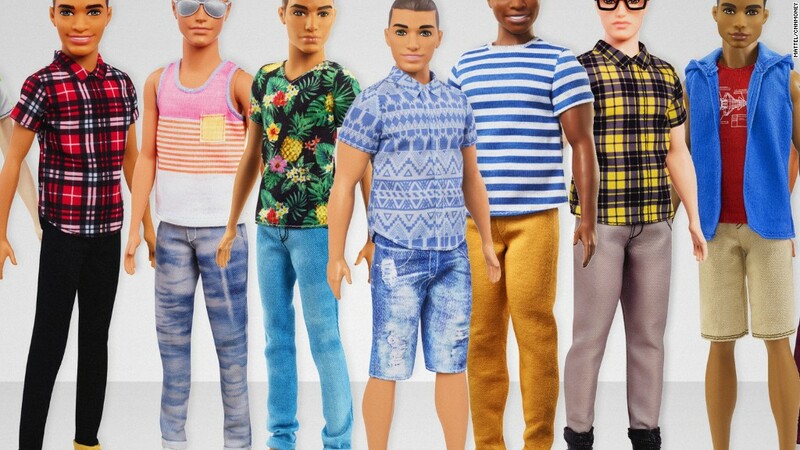 It's going to take more than a new lineup of Ken dolls to revive the fortunes of toy maker Mattel, especially as rival Hasbro boasts some of its best performance ever. Mattel's stock is down 27% this year, and is trading at its lowest level since the summer of 2015. Mattel (MAT) slashed its dividend at its analyst day last week, a move that investors clearly did not like. What exactly does that mean? Essentially, the company is introducing interactive toys, games and live content to go along with its five core brands -- Barbie, American Girl, Fisher-Price, Hot Wheels and Thomas & Friends. It could take some time for this new strategy to lead to a big improvement in its finances. Wall Street is predicting that profits will be flat this year and that sales will be up only about 3% from a year ago. Earnings growth is expected to rebound in 2018, but analysts think sales growth will slow to just 2%. As Mattel struggles, competing toy maker Hasbro (HAS) -- the Coke to Mattel's Pepsi -- is thriving. Hasbro's stock is up more than 40% this year and is trading near an all-time high. Wall Street is estimating that the company's profits and sales will grow about 10% this year. Hasbro is making toys that parents are buying and kids are playing with - including products like Nerf, Transformers, and even old school, classic board games such as Monopoly. Hasbro also has already made a shift to digital that is also helping it outperform Mattel. The company said in the first quarter that sales of games were up more than 40% in the first quarter -- and that growth in digital games helped fuel that rise. And if all that weren't enough, Hasbro has lucrative licenses for toys tied to various Disney (DIS) franchises as well -- most notably, Star Wars, Marvel and the Disney Princesses. During the company's last earnings conference call with analysts in April, Hasbro CEO Brian Goldner said sales of toys tied to the classic lineup of Disney Princesses (think Cinderella and Sleeping Beauty) remained strong. But the top seller was Belle from "Beauty and the Beast." Hasbro expects sales of Belle dolls to remain red-hot thanks to the hit live-action movie starring Emma Watson -- of Harry Potter fame -- that came out earlier this year. Toy sales from the Disney films Frozen and Moana remain strong as well, Hasbro said. Hasbro is also expecting a boost from Marvel superheroes. Hasbro has toys tied to the summer's big hit "Guardians of the Galaxy: Vol. 2" (Baby Groot! ), the new Thor movie due out in November and next month's "Spider-Man: Homecoming" -- which is co-produced by Marvel and Sony's (SNE) Columbia Pictures. So if Mattel is going to get back on track and gain an upper hand on Hasbro, it's going to have to find fun new toys that kids actually want. A digital strategy, in of itself, may not be the answer. Having strong licenses tied to big Hollywood hits clearly helps as well.